BUKAL is a network which leads environmental campaigns, education and actions against large scale mining projects and coal-fired power plants and for the conservation and protection of the natural resources, ecology and communities in the province of Batangas. The network is comprised of organizations and individuals from various sectors such as the church, academe, scientists, fisherfolks, peasants, youth and environmental advocates. BUKAL was an organizational awardee of Gawad Bayani ng Kalikasan 2015. Being active on campaigns involving protest actions and resistance against development aggression, leaders and members of BUKAL Batangas continue to face harassments and surveillance from state military and police forces. Last November 21, 2017, seven of their members were illegally arrested and detained for the charges of attempted murder. On March 2018, the case was dismissed by the fiscal office. Also, another seven members were also part of the terror list released by the Department of Justice last March 2018 and five out of those on the list were already arrested. 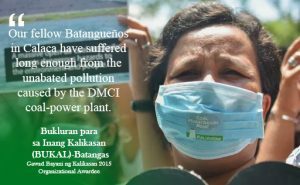 As of March 17, 2016, secretary general of BUKAL- Batangas, Peti Enriquez, joined environmental groups in a picket-dialogue at the Department of Environment and Natural Resources (DENR) in Quezon City to agonize the on-going operations of coal power plants in Calaca, Batangas. BUKAL voices out that three decades of Calaca coal plant operations adversely affected the people’s live and livelihood. Many of their campaigns gained ground not only in province of Batangas but are also amplified in the national level, giving inspiration to other local organizations and communities defending their own environment and rights. There have been 56 extrajudicial killings of environmental defenders under the term of President Rodrigo Duterte and countless more harassments, illegal arrests, filing of trumped-up charges and other human rights violations. The Center for Environmental Concerns – Philippines remembers the brave environmental heroes awarded in the biannual Gawad Bayani ng Kalikasan to remind and inspire us to continue protecting the environment and people’s rights.